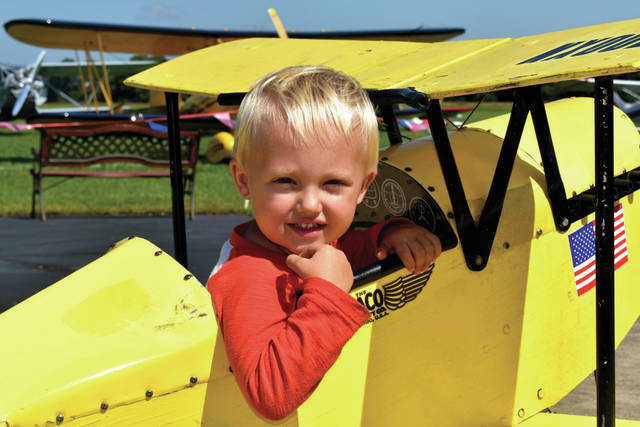 Cody Willoughby | AIM Media Jack Holtvoigt, 2, of Huber Heights, takes a ride in a pedal-plane during the WACO Vintage Fly-In on Friday. The Fly-In will be held 9 a.m. to 4 p.m. at WACO Air Museum through Sunday. Cody Willoughby | AIM Media A vintage bi-plane prepares to embark upon a flight as a second bi-plane takes off during the WACO Vintage Fly-In on Friday. The Fly-In will be held 9 a.m. to 4 p.m. at WACO Air Museum through Sunday. Cody Willoughby | AIM Media Mike Gidding assists Carolyn Warren and Herman Ahrns of Goodwill Easter Seals after a bi-plane ride with pilot Bob Wagner during the WACO Vintage Fly-In on Friday. The Fly-In will be held 9 a.m. to 4 p.m. at WACO Air Museum through Sunday. Cody Willoughby | AIM Media Pat Liddy of Troy waves goodbye to onlookers before taking a bi-plane ride with Randy Philipps of Knoxville, Tenn. and pilot Steve Koch during the WACO Vintage Fly-In on Friday. The Fly-In will be held 9 a.m. to 4 p.m. at WACO Air Museum through Sunday. 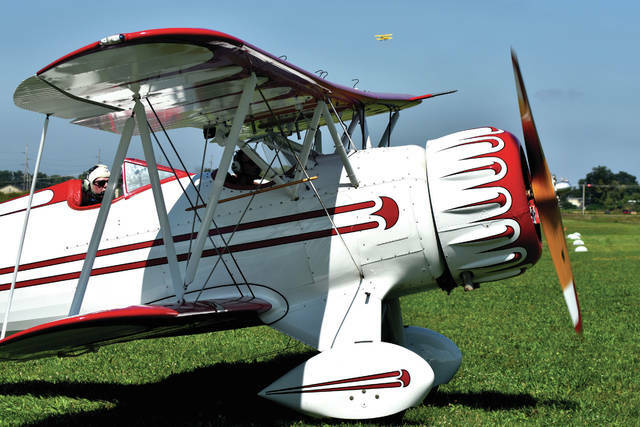 TROY — The 21st annual WACO Vintage Fly-In opened with a breezy beginning with sunny skies and warm temperatures on Friday, as dozens of vintage bi-planes flew in from throughout the region. The event is set to continue at the air museum, located at 1865 S. County Road 25-A, from 9 a.m. to 4 p.m. on Saturday and Sunday. Tickets for adults will run $6 daily or $10 for a weekend pass. Tickets for students will run $3 daily or $6 for a weekend pass. Children 4 and under will be free of charge. Saturday will feature the “Parade of WACOs” at 1 p.m., in which pilots will be taking several WACO planes into the air to demonstrate their skills, as well as various children’s activities throughout the day, including a radio-control demo at 2 p.m., a plane-train, a rocket-building station, and fingerprint art. Frames for fingerprint art will be available for purchase on site to benefit the construction of the new learning center. Sunday will feature an assortment of World War I airplanes and Dayton Ultralights from 11 a.m. to 2 p.m., as well a vehicular display from Premier Health Care Flight from 12-2p.m. New to the event this year is the Ohio Cruisers Car Show, which will be on display at the center all day on Sunday. “We’re expecting a couple hundred cars on site,” Hawk confirmed. The center will also be offering first-come, first-serve bi-plane rides in two of its historic bi-planes throughout the weekend. Tickets will run $100 per person for a 12-minute ride, and $300 per ride for two people for a 30-minute ride. The WACO Vintage Fly-In is sponsored by Baird Funeral Home, Bud Polley’s Floor Center, Frings & Bayliff Funeral Home, Peak Foods, St. Mary’s Tool & Die, and William & Boss Jewelers. Open since 1997, WACO Air Museum and Learning Center is an organization with the goal of preserving aviation’s past and actively work to nurture aviation’s future. For more information, visit www.wacoairmuseum.org, or find WACO Historical Society on Facebook. https://www.dailycall.com/wp-content/uploads/sites/30/2018/09/web1_Waco-1-.jpgCody Willoughby | AIM Media Jack Holtvoigt, 2, of Huber Heights, takes a ride in a pedal-plane during the WACO Vintage Fly-In on Friday. The Fly-In will be held 9 a.m. to 4 p.m. at WACO Air Museum through Sunday. https://www.dailycall.com/wp-content/uploads/sites/30/2018/09/web1_Waco-2-.jpgCody Willoughby | AIM Media A vintage bi-plane prepares to embark upon a flight as a second bi-plane takes off during the WACO Vintage Fly-In on Friday. The Fly-In will be held 9 a.m. to 4 p.m. at WACO Air Museum through Sunday. 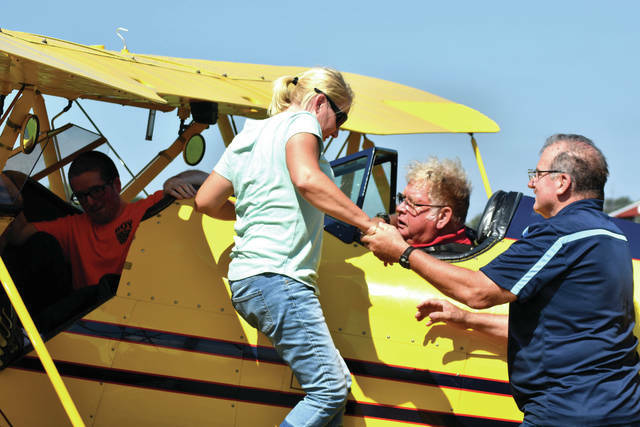 https://www.dailycall.com/wp-content/uploads/sites/30/2018/09/web1_Waco3.jpgCody Willoughby | AIM Media Mike Gidding assists Carolyn Warren and Herman Ahrns of Goodwill Easter Seals after a bi-plane ride with pilot Bob Wagner during the WACO Vintage Fly-In on Friday. The Fly-In will be held 9 a.m. to 4 p.m. at WACO Air Museum through Sunday. 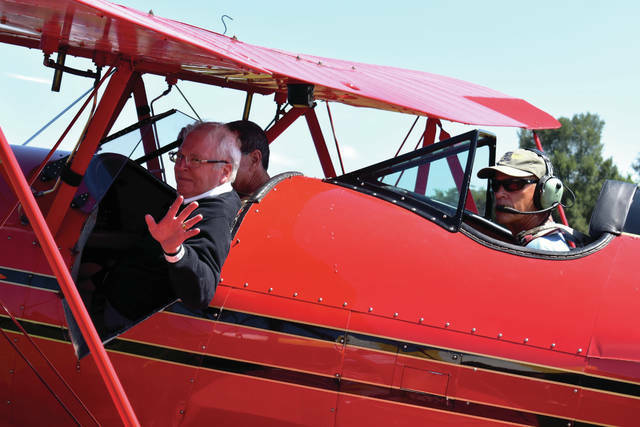 https://www.dailycall.com/wp-content/uploads/sites/30/2018/09/web1_Waco4.jpgCody Willoughby | AIM Media Pat Liddy of Troy waves goodbye to onlookers before taking a bi-plane ride with Randy Philipps of Knoxville, Tenn. and pilot Steve Koch during the WACO Vintage Fly-In on Friday. The Fly-In will be held 9 a.m. to 4 p.m. at WACO Air Museum through Sunday.